LOVE LOVE LOVE Pumpkin Goodies! 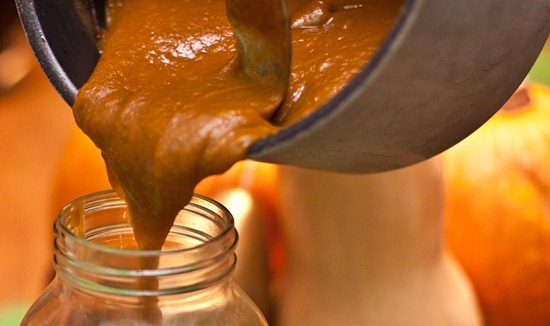 Now is a good time to make this pumpkin butter. It will last you all month and its a great homemade treat to have on hand for “emergency gifts”. I made my batch today and im putting it in these small pint size jars and storing in the frig to have when needed. Wrap it up along side of fresh made zucchini or banana bread. I have a great french toast recipe that this is an ingredient in that I will share later. You can mix in oatmeal or spread on your morning toast. This is super easy to make and much cheaper than store-bought. I have purchased from Williams and Sonoma and Trader Joes and I think this tops both in price and flavor. November keeps us busy with preparing for the holiday season and I think this pumpkin butter will enhance your holiday baking and gift giving. Hope you enjoy it as much as I do. This is where I got my recipe and a tweaks I did to it to make it my own. I did not add the ginger for my first time but I think I will try it the next time. I get my cinnamon from Dr.Sweet (how appropriate) local doctor here in Havasu. Its organic and really seems like the real stuff. He is a homeopathic Doctor and gives it to me since I’m a patient of his 🙂 Also I used Spiced Apple Cyder instead of Apple juice cause that is what I had. I am a firm believer of using what ever you have as long as its close cause you never know it might be better and sometimes it just does not matter. I’m thinking of trying a batch with 1/4 teaspoon or less of cayenne pepper. What do you think? Bam that will put a kick in it. Makes 3.5 cups and stores well for up to 3 weeks so you are good to go thru Thanksgiving if you start now. Pumpkin Butter is super easy to make and smells like fresh-baked pumpkin pie as its cooking. If you love pumpkin goodies you will love this. 1. Combine pumpkin, apple juice, spices, and sugar in a large saucepan and stir well. Bring mixture to a boil, covered with lid ajar (I prop it with a wooden spoon). Reduce heat to low-medium and simmer, covered with lid ajar, for 35-45 minutes, stirring frequently. Be careful as the mixture bubbles and pops! 2. Remove from heat and let it sit for a few minutes before removing lid. Adjust spices to taste. Stir in lemon juice. Once cool, pumpkin butter can be kept in an airtight container in the fridge for up to 3 weeks. Makes enough to fill one large mason jar or about 3.5 cups. 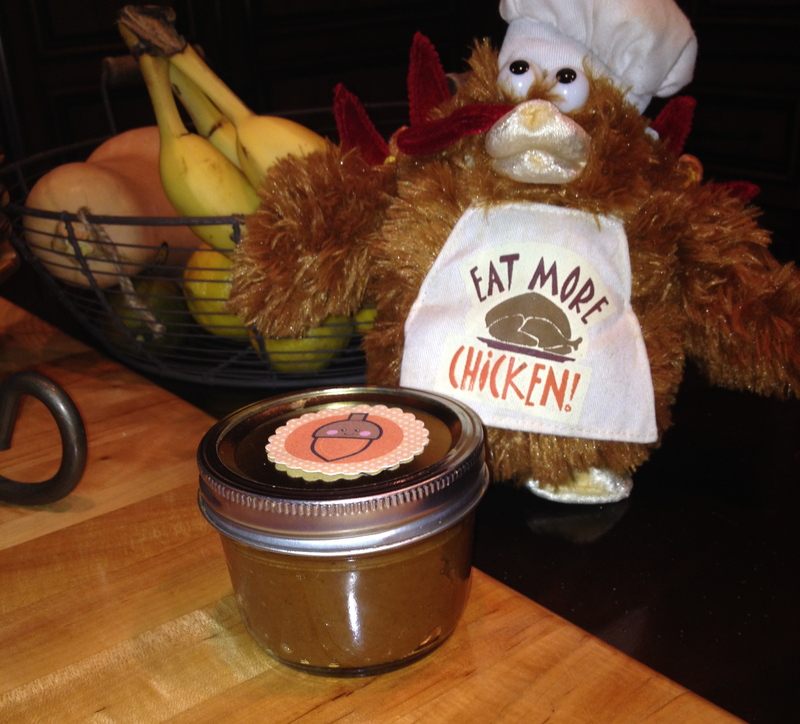 Get your super cute Mason jar and set aside…I packed my Pumpkin Butter in small Mason Jars for give aways.